A towering fortress of a play - there isn't a single crack in it. The Crucible is a play that doesn’t need updating. The Old Vic’s production, now available to watch online via Digital Theatre, doesn’t just understand that: it makes a principle of it. Where one might be tempted to emphasise Arthur Miller’s parallels with the Communist witch hunt of the McCarthy era or update the religious fanaticism for the modern day, director Yaël Farber strips everything down to its bare bones: this is sinewy, raw, overpowering theatre. Events are staged in the round, as part of a season that saw the London theatre transformed into a circular arena. The effect, even on screen, is intimidating: audience members gather in the shadowy darkness, turning the entire room into a courtroom of silently judging eyes, a crucible intently purifying the elements at its centre. The cast heat things up quickly, led by a fiery performance from Richard Armitage. 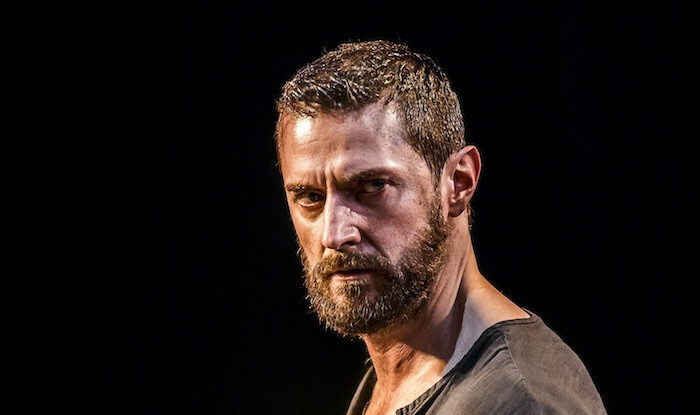 He throws himself into the middle of the auditorium as John Proctor, beginning the play commanding and confident. When the good-hearted husband hears of village girls dancing around a fire at night, he dismisses any talk of spells as nonsense. But the reports begin to carry a scary amount of credibility, as, one by one, the women of Salem confess to being under the influence of black magic. The women writhe and wriggle with disturbing urgency, as feverish as the God-fearing men who pursue them. But it’s when they move silently in unison that the play is at its eeriest: as Natalie Gavin’s fantastically earnest Mary Warren prepares to testify in Proctor’s favour, the others enter the court, a slow march silhouetted against a searching white light. Imogen Knight’s choreography is consistently superb, right from the opening, which see a procession that takes place in near darkness. The action is interspersed with periods of such movement, breaking up Miller’s dialogue with an oppressive quietness – an effect amplified by the use of lamplights in the gloom. Digital Theatre has always excelled at translating action from stage to screen and this is no exception: behind the cameras, director Robert Delamere captures the closed-in space with a claustrophobic suspense. It’s no surprise that Mary cowers to the pressure of her peers, or that the rest of the community follows suit. Samantha Colley’s Abigail leads the pack, swishing her hair and screaming with terrifying conviction. Even as we’re reminded of her feelings for John, as she rallies the group to incriminate his wife, Elizabeth, it’s hard not to get swept up in her act. Hale’s gradual realisation of what’s happening brings a tragic weight to proceedings. While the male members of the ensemble spend much of the play’s runtime shouting loudly, though, it’s the gentle reconciliation between Anne Madeley’s Elizabeth and her husband in the final act that really hits home; an encounter that, without embellishment or updates, reminds us of the persistent ability of lies to overrule honesty, of faith to blindly obscure fact and of mob mentality to drown out the individual. Above the din rises Richard’s innocent man, sporting a ragged beard and dishevelled outfit that seems to fall apart in front of us. “What is John Proctor?” he cries to the heavens, his voice hoarse from the strain. It’s a colossal performance in a towering, timeless play that, thanks to Farber’s lack of fuss, feels even more relevant today. At three and half hours, The Crucible is a monumental piece of theatre. It’s a fortress – and there’s isn’t a single crack in it. The Crucible is available to rent and download from DigitalTheatre.com. For more digital theatre reviews, click here.